At the outset, permit me to congratulate you and the members of the Bureau on your election to this important Commission. I wish to extend my delegation’s fullest support to the work of the Bureau and to a fruitful outcome for the deliberations of this Session. We welcome this year’s theme “Review and Appraisal of the Programme of Action of the International Conference on Population and Development and its contribution to the follow-up and review of the 2030 Agenda for Sustainable Development.” This is very timely, given that we are already 3 years in to the implementation of the 2030 Agenda for Sustainable Development and the many challenges we face in this regard. Today, we celebrate 25 years of adopting the ICPD Programme of Action, where 179 governments pledged to deliver inclusive, equitable and sustainable development, based on individual rights, freedom and dignity. Such a mandate helped us to consolidate policy and achieve progress on empowering women and girls, who are crucial to the development of families and societies around the world. Yet, as we face the future, we are confronted with enormous challenges that threaten our implementation efforts. Climate change, rapid urbanization, population growth, changing age structures and migration, are a complex web of factors that will have to be addressed, if we are to achieve meaningful progress in the future. These issues have had an impact on Sri Lanka’s population, which is currently at 21 million and growing. It has been a cause for concern that the ratio for children under the age of 15 years has been on the decline, whilst the proportion of working age and the elderly, has risen. As Sri Lanka’s ageing population continues to increase in the future, it will have a negative impact on our efforts in implementing the 2030 Development Agenda. With changes in demography and lifestyle, Sri Lanka is also facing new health challenges. Non-Communicable Diseases such as heart disease, diabetes, cancers and asthma are increasingly prevalent. As Sri Lanka engages in peacebuilding and reconciliation after a long drawn conflict, one of the key challenges we face is women headed households. Among the initiatives launched by the Government of Sri Lanka has been to set up institutional mechanisms to enable female headed households to integrate into the workforce and access sustainable livelihoods, particularly in the Northern Province. Sri Lanka recognizes that inclusive development rests on ensuring equal opportunities in the workplace. We have put in place necessary legal and structural mechanisms to ensure gender parity in the workplace. Sri Lanka has a universal healthcare system that provides free healthcare to its citizens. The Ministry of Health, together with the Health Services as Provincial level, provides a wide range of preventive, curative and rehabilitative healthcare. The country has an extensive network of health institutions, with a hospital accessible every four kilometres. As a result, it has one of the highest life expectancy rates in the region, with 72 years for males and 78.5 years for females. Sri Lanka has also made great strides in improving maternal and child health and welfare. Well over 90% of births are attended by skilled persons, within healthcare institutions. As a result, the Maternal Mortality Rate is 35 per 100,000 live births and the Infant Mortality Rate is 9.5 per 1000 live births. The Government of Sri Lanka has also introduced nutritional supplements for pregnant women and also for young children. The “Thriposha” programme has been a great success in this regard. 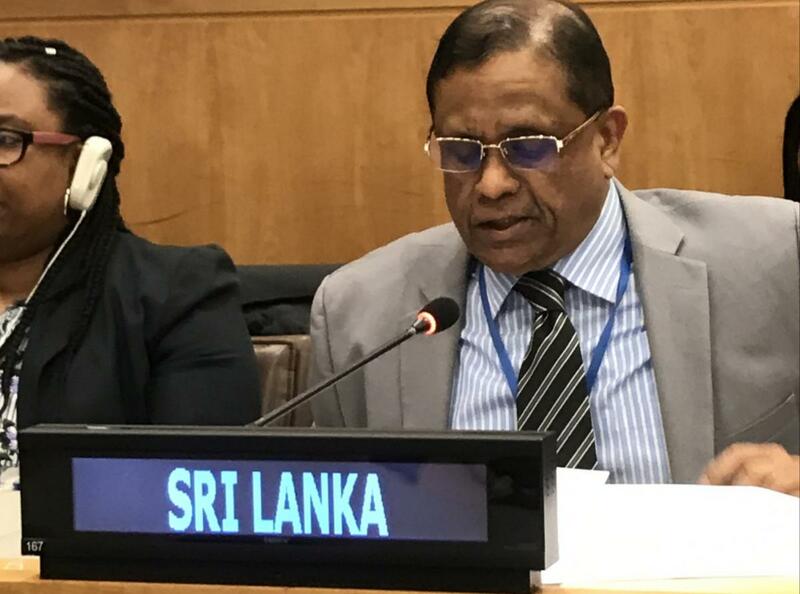 Sri Lanka has also focused on improving the sexual and reproductive health services and to enable young persons to gain greater access to information, particular on gender, sexuality, contraception and sexually transmitted diseases such as HIV. Family planning was first introduced to Sri Lanka in 1953 and a decade later, it was well integrated to the maternal and health services. Today, fertility rates remain at 2.2% and the Contraceptive Prevalence Rate is at 67.3. Sri Lanka is aware that the potential of women and also youth need to be harnessed in our efforts to achieve sustainable development. We are strongly committed to enabling both women and youth opportunities to contribute to the enrichment of society and be an integral part of our country’s economic and political decision making processes. To this end, Sri Lanka will work on both its national and international obligations. We pledge our full support for the ICPD Programme of Action and work with the international community to fully realize our aspirations based on the 2015 Development Agenda.